Zion Market Research has published a new report titled “Pharmacovigilance and Drug Safety Software Market by Functionality (ADR Reporting Software, Drug Safety Audits Software, Issue Tracking Software, and Fully Integrated Software), by Delivery Mode (On-Premises and On-Demand), and by End-User (Pharma & Biotech Companies, Contract Research Organizations (CROS), Business Process Outsourcing (BPO) Firms, and Other Pharmacovigilance Service Providers): Global Industry Perspective, Comprehensive Analysis, and Forecast, 2018–2025”. 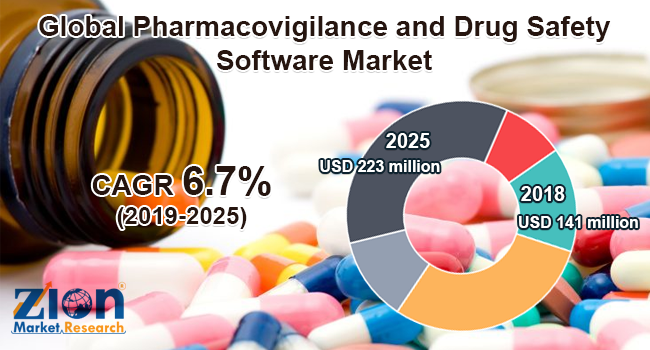 According to the report, the global pharmacovigilance and drug safety software market was valued at approximately at USD 141 million in 2018 and is expected to generate around USD 223 million by 2025, at a CAGR of around 6.7% between 2019 and 2025. According to the World Health Organization (WHO), pharmacovigilance is the science and activities related to the understanding, evaluation, detection, and prevention of adversarial reactions to medications or problems related to medicine. The scope and definition of pharmacovigilance have evolved to identify the significance of a systems approach for improving and monitoring the harmless and safe use of medicines. Pharmacovigilance and drug safety software or tools aid in classifying, reviewing, and forming pharmacovigilance data. This software also helps in the formation of repots related to adverse medical events. Additionally, the pharmacovigilance software is majorly used by biotech and pharmaceutical organizations, business process outsourcing firms (BPOs), contract research organizations (CROs), and many other pharmacovigilance service providers. Pharmacovigilance globalization with extensive availability and access of the internet is likely to fuel the global pharmacovigilance and drug safety software market in the future. Moreover, the augmenting adoption of pharmacovigilance software by numerous outsourcing companies will also serve as a huge growth opportunity for the global pharmacovigilance and drug safety software market over the forecast timespan. The global pharmacovigilance and drug safety software market is segmented on the basis of functionality, delivery mode, and end-user. Based on functionality, the market is segmented into drug safety audits software, ADR reporting software, fully integrated software, and issue tracking software. The fully integrated software segment is expected to register the highest growth over the forecast time period, owing to the increasing need to prevent errors in database management regarding medicines. By delivery mode, the market is segmented into on-premises and on-demand. The on-premises segment is anticipated to hold the largest market share, owing to its rising adoption by large pharmaceutical companies as it encompasses the installation of solutions and services on desktops within the organizational premises. Alternatively, the on-demand segment is anticipated to register the highest CAGR globally. By end-user, the market is segmented into contract research organizations (CROS), business process outsourcing (BPO) firms, pharma and biotech companies, and other pharmacovigilance service providers. The pharma and biotech companies are estimated to dominate the global pharmacovigilance and drug safety software market over the forecast timeline, owing to the high software adoption of to aid clinical trial activities and decrease medical expenditures. The contract research organizations (CRO’S) are anticipated to show the highest CAGR in the global pharmacovigilance and drug safety software market, owing to increasing outsourcing activities in pharmaceutical and biotech companies. By region, North America is anticipated to lead the global pharmacovigilance and drug safety software market over the forecast period, owing to the high adoption of pharmacovigilance and drug safety software and favorable government regulations. Europe was the second largest market in 2018, followed by the Asia Pacific. The Asia Pacific pharmacovigilance and drug safety software market is anticipated to record lucrative growth over the projected time period, subject to an increasing number of clinical trials being conducted in the region and the considerable cost-saving benefits.